Fellow Nigerians, this season of jolliness and bonhomie has not been the best of times for the ruling party, APC, and certainly not for its Presidential flagbearer, President Muhammadu Buhari. It may not be unfair to say that this has been one of the worst weeks since the President returned to power on May 29, not May 19, 2015. The President has come under a barrage of social media attacks for series of gaffes on his part in recent time. The first was the interview he granted the Editors of Thisday newspapers and their sister station, the fast rising, Arise News Channel. That amateurish video production was so dire and awful that had it not emanated from the Presidency it would have been condemned immediately as trash. As it is, it seems symptomatic of the malaise currently dogging the President and his team. The story was told of how the President’s handlers insisted they must handle the recording themselves and hand the tape over to Arise News Channel. That is fine, no problem, but the production turned out to be beneath acceptable standards of journalism and certainly belied the efficiency and perfection one would expect from the Presidential Team. The audio and vision were not the best, not to talk of the meat of the interview itself. The President came across as someone not too sure, or confident, of himself, and what his job entails. The unfortunate display which was avidly circulated by social media aficionados did not compliment the President at all. As if that was not bad enough, there was yet another interview, in quick, rapid-fire succession, organised on the government-owned NTA. This one was a total PR disaster for President Buhari despite the fact that the cerebral Vice President, Professor Yemi Osinbajo was co-interviewed by one of the best television personalities in Nigeria, and beyond, Kadaira Ahmed, and in his inimitable intellectual, charismatic and charming manner, the Vice-President tried to limit the damage being done by his boss. As much as the interviewer tried to be mild-mannered and pleasant, unlike her usual combative style, the interview just didn’t flow in the right directions. Opportunities were missed and justifications and explanations were stilted. There were just too many negative soundbites which ignited cyberspace and in no time went viral globally. 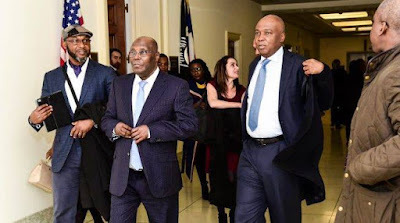 As they say, when it rains it pours, and this was the case for APC, two days ago, when The Boss, a popular online newspaper, broke the news of Atiku Abubakar’s trip to the United States of America. For over a decade Alhaji Atiku Abubakar had not been able to obtain a US visa talk less of travelling in that direction. It was one of the nagging questions I posed to him when I got an exclusive session with him in Lagos, long before he won the PDP ticket. His answer became a major point of controversy, as he told me, candidly, that he had applied for American visa and was yet to be granted. Naturally, his political enemies went ballistic and taunted me and him endlessly about his inability to enter the US, as if I was his spokesperson and more importantly as if a visit to the US was indeed a precondition for winning the Presidential election. Many swore that he would never surmount that obstacle, matter-of-factly. They stubbornly rejected the notion that if Atiku was afraid of America, he would never have attempted to apply for a visa, in the first instance and, that, if America wanted him so badly, he would have been granted the visa so that he could be snared and entrapped, or in the absence of that, he would have been put under International Police (Interpol) watch, and he would have long since been picked up on one of his frequent trips abroad. Truth is logic no longer knows logic in our climes. So, it was assumed that Atiku and America were on permanent divorce, due to irreconcilable differences. At a point, even the ruling party warned the United States not to be swayed or tempted to issue him the much sought-after visa, and everyone wondered if it was their business to dictate to America. Now, let’s fast forward. Atiku won the Presidential ticket of PDP and went about his business. His victory was dismissed by the APC as a non-event and its supporters even boasted, openly, that Atiku will never defeat Buhari. They never forgot to end by adding, “a man who cannot attempt to enter America.” But the ways of God are not the ways of man. The men of power began to flex muscles and subjected Atiku to subliminal attacks. A Vice-President of the Federal Republic of Nigeria for eight years, from 1999 to 2007, some courtesies that used to be extended to him were suddenly withdrawn. His plane was frisked, and he complained about being searched, more than usual, on return from one of his foreign trips, but the gentleman bore it all with equanimity. In no time, thereafter, rumours began to fly about the seeming and perceived intimidation of his supporters. His campaign found it tough to raise needed funds. No one wanted to fall into the hands of Buhari’s goons. But Atiku remained defiant and trudged on, like the old Roman soldier. His campaign was dissed as lacklustre, and not able to match Buhari’s fire-power and razzmatazz. All seemed tight and tough for Atiku but he maintained a steady focus. His campaign started at a slow but steady pace. Surprisingly, he kept packing the crowds, while the Director General of The Atiku Abubakar Presidential Campaign and The President of the Nigerian Senate, Dr Abubakar Bukola Saraki, remained uncharacteristically upbeat. He was dancing so much at rallies that many began to wonder the source of his sauce. He constantly lit up the campaigns. Saraki and former Ekiti State Governor, Ayodele Fayose, stewed so much as they danced Shaku Shaku style and tried to compete with our best choreographers. We didn’t have to wait long for answers to the posers. It landed, without warning, at my desk Thursday afternoon. I was on a flight from Monrovia, Liberia to Lagos, Nigeria, and was in transit in Accra Ghana, when it landed, thunderously. Scoops are the best meals of journalists. It won’t be wrong to call them our opium. Before we took off, I quickly drafted an urgent press release which I fired to our Editors. Their initial response was that of incredulity, but I told them to shoot immediately. No other media group should beat us to this. You only get such exclusives once in a green moon. By the time we landed in Lagos, I rushed to put on my phone and ran to open my biggest addiction, Twitter, something I share in common with President Donald Trump. I was happy our story was everywhere but sad our mainstream media seemed unable to confirm the biggest story of the year, or too scared to take a risk because they felt it was an impossibility. As soon as we disembarked, and I climbed into my waiting car, I zoomed to work on my phone, frantically. I called some impeccable contacts who gave me the blow by blow account of how Atiku left Nigeria, unannounced, and obtrusively, on his most important journey ever, the game-changer any politician would wish for, exactly one month to the biggest election of all time. I called the Editors and fired some more authoritative gist. We did an update on how Atiku left Lagos, in company of Saraki and Senator Ben Murray Bruce and others. Then my phones began to buzz. I was told Daily Trust has debunked our story based on an interview granted them by Atiku’s media aide, Paul Ibe. I simply ignored the talk of the story being fake. I expected Paul to avoid being so categorical but… We moved on knowing news bomb would soon explode and expose whoever was right or wrong. This time, it was how Atiku’s plane filed a flight plan to London, from where it changed and headed to Washington. All this while doubters, and APC supporters, were on my case, flashing the Daily Trust story at me, but I remained unperturbed. I saw a Punch story that the Nigerian Embassy said it was aware of Atiku’s presence in the US. I smiled to myself, knowing very soon, they will know by which technology he navigated his way to America. Soon, and very soon, we shall see the Wazirin in America. I already queued up for the first pictures. And it came. That was how in one second, Atiku, or the Atikulated campaign, took off with uncommon favour and fervour. My dear friends in APC went quiet, a few threw the usual tantrums. I had expected them to pretend a little, but they couldn’t hide their shock and, possibly, disappointment in America. By yesterday, my big Brother, Alhaji Lai Mohammed came out of the grove to declare, majestically, that if Atiku likes, he can pick up a green card in America and stay there for as long as he wants. Wow, he was not done. He became an instant Prosecutor, or Minister of Justice, EFCC boss or Supreme Court Justice, when he pronounced Atiku guilty of bank fraud and malfeasance, and that he should be ready to answer questions about the collapse of Bank PHB, upon his return. This coming after about one day gone in the United States, and one month to the start of the general elections. Lord have mercy. Why is APC fighting on all fronts? Who is misleading my friends and, once upon a time, fellow Buharists. Are they not tired of this commotion, tension and confusion. Not too long ago, the Senate President and the legislature; more recently, the CJN and the Judiciary; now the leader of opposition, Atiku Abubakar. My prediction is very simple and straight-forward. It seems to me that APC needs a miracle to win the next election, if it continues to follow this destructive path. APC has inflicted these difficult times on itself. I am not sure that some of the distinguished party faithful are not working directly against the interests of the party and its presidential candidate. There are apparently Fifth Columnists abroad! Otherwise, the only other thing that can be said is that the party appears to be hell bent on following the PDP template for rejection and failure that the same APC constantly and serially condemned just before the last elections. All the party’s antics now smack of great desperation and panic attack as they seek to land the plum job of President of Nigeria. The senior members should have summoned the courage to advise the President to serve only one term, especially after his health failed so spectacularly two years ago. His amiable, cerebral and inspired Vice-President would have taken over and unified the country. But hell no, they didn’t see the need. How on earth, and at this time and age, did APC expect Buhari to run a serious campaign and manage a big and complex country like Nigeria, given all that seems to be wrong? At least the President was honest enough to acknowledge this when he ceded leadership of the campaign to the irrepressible Asiwaju Bola Ahmed Tinubu. The only problem is that this gambit itself appears to have backfired as the President has made more appearances on the campaign trail and hustings than the appointed leader of the campaign. I’m wondering if APC remembers the promises made to Nigerians to make the economy better, corruption exterminated, the Naira stronger and security tighter. In good conscience, have they delivered? This, will be answered hopefully next month, when the people troop out to vote.